A lovely, light moisturizing oil containing a blend of:Caprylic/Capric Triglycerides, Grape Seed Oil, Virgin Organic Argan Kernel Oil, Castor Seed Oil, Meadowfoam Seed Oil, Macadamia seed Oil, Olive Fruit Oil, Jojoba Seed Oil, Rice Bran Extract, Rosemary Leaf Extract, Sunflower Extract, Tocopherols, and scented with a special blend of lavender & vetiver essential oils. Lavender with its light floral scent and vetiver with its sweet, woody scent are very compatible fragrances. Both are said to aid in relaxation, and reduce anxiety. This oil is light enough to spray on your skin, and it absorbs easily giving your skin a very soft, velvety feel. This oil may stain fabrics. 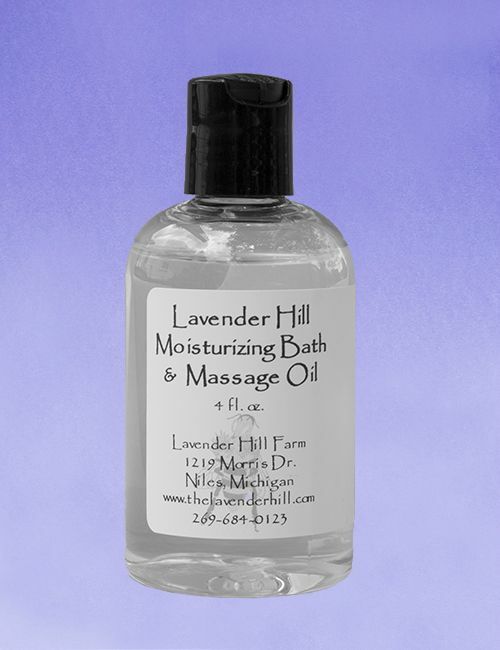 The 4 oz bottle comes with a fine mist sprayer-top so you can easily spray it on after a shower or bath, or anytime!